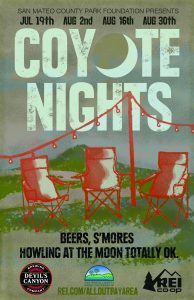 Home Posts tagged "Devil’s Canyon"
On July 19, San Mateo County Parks Foundation is back with Coyote Nights—our summer evening social where howling at the moon is totally okay 😉 ! We return with our partners, REI Co-op and Devil’s Canyon Brewing Company, to bring you a cool way to wind down after work. REI will set up their outdoor lounge and trail mix bar. Devil’s Canyon will bring their tasty brews and San Mateo County Parks Foundation will have “trailheads” of activities and information based on the theme of the evening. All four events take place 6-8 p.m. at the Captain’s House at Coyote Point.